Three years ago, while fighting for justice to his friend Rohith Vemula, 30-year-old Vijay Kumar Pedapudi, a Dalit scholar, made a resolve to join politics. The events that followed in the university and elsewhere, and the movement for justice for Rohith being ‘crushed’ further strengthened his resolve. 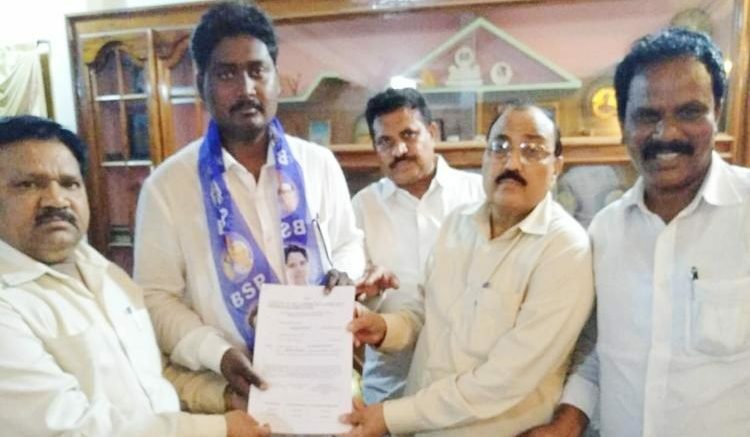 Today, Vijay – a PhD student from University of Hyderabad – who was one of the five expelled students along with Rohith Vemula, has announced his political entry in the upcoming Andhra Pradesh Assembly elections. He will be representing the Bahujan Samaj Party and contesting from Parchur segment, which is a general constituency. After the announcement of his political entry on Facebook, Vijay is flooded with calls from ASA students across the state, who are willing to volunteer for his election campaign. A native of Muppalla village in Prakasam district, Vijay is also the president of Ambedkar Students’ Association, Andhra Pradesh unit. A politically charged student who is pursuing his PhD in Political Science, Vijay aggressively fought against the ABVP in the UoH campus and against the BJP, whom he holds responsible for the death of Rohith Vemula. Before foraying into mainstream politics, Vijay had unsuccessfully contested as the President of the Students’ Union in 2016, UoH, without any alliance. This was shortly after the death of Rohith Vemula, a member of ASA, who killed himself after being expelled from the hostels as a disciplinary action for allegedly assaulting an ABVP leader. “I realised what we could achieve through political power. Through political power, big movements can be crushed,” he says referring to the Rohith Vemula movement. In December 2015, five students – Rohith Vemula, Vijay Kumar Pedapudi, Seshu Chemudugunta, Sunkanna Velpula, and Dontha Prashanth, all members of ASA from UoH – were punished for allegedly assaulting Nandam Susheel Kumar, the then-ABVP president of HCU. According to the students, Susheel allegedly called the ASA students ‘goons’ on Facebook. The sequences of events that followed included exchange of letters between the then-MHRD minister Smriti Irani, then-Union Minister Bandaru Dattatreya, and Vice Chancellor Podile Appa Rao. The committee constituted to probe the incident found the accused students guilty. Shortly, after being expelled, with several restrictions imposed on them which the ASA terms ‘social boycott’, Rohith Vemula killed himself on January 17, 2016. For the General Elections and the Andhra Pradesh Assembly elections, BSP has formed an alliance with the Pawan Kalyan led Jana Sena Party. Out of the 175 Assembly seats and 25 Parliamentary seats, BSP would be contesting from 21 Assembly and three MP seats. The alliance also includes CPI and CPI (M). Elections would be held in Andhra Pradesh on April 11. Be the first to comment on "Dalit scholar Vijay Pedapudi who was expelled with Rohith Vemula, contests AP polls"